It’s no secret that this blog has been mostly focused on California, a few years ago I started writing about Syrah from other parts of the world but, probably because I live in California, that Golden State focus has endured. I believe that wine is really more interesting when you know its context and although I enjoy wines from the Northern Rhone, I have yet to make a trip there. I definitely want to go in the near future and make that pilgrimage to Syrah’s birthplace. In the meantime, I’ll keep trying the gorgeous French wines available here in the States and hope that will provide enough interest for these posts. 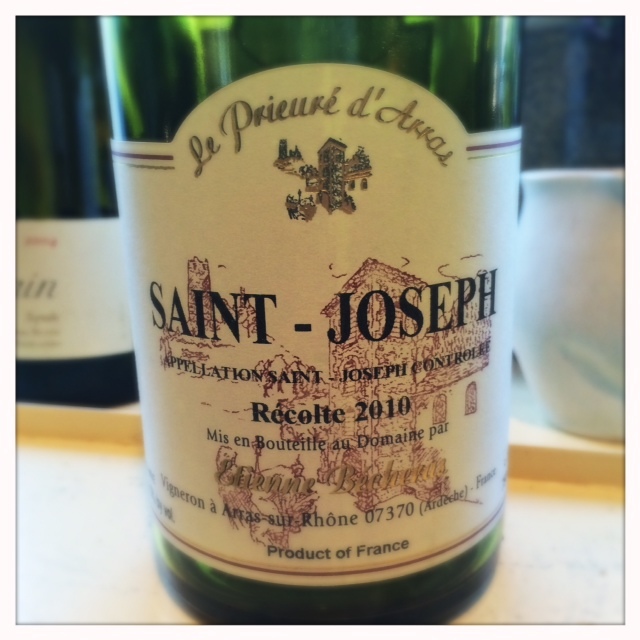 St. Joseph is the lighter more playful side of the Northern Rhone. The wines go with lots of different types of food (even fish). They are generally less tannic, less big, but perhaps just as serious as wines from Hermitage, Cornas, or Côte-Rôtie. Beautiful honeysuckle aromas on the nose mixed with some earthy tobacco aromas. There’s a sweetness on the nose that translates to a very dry mid-palate. This is what I love about St. Joseph. It has floral aroma but great acidity makes it super food friendly. We had it with some homemade carne asada tacos and it worked well. The finish is not too tannic but there are tannins there. The Courbis grapes are de-stemmed and the wine is aged in neutral oak casks. Again, an elegant wine that smells sweet but finishes dry. Not as dry as the previous wine but also has beautiful acidity on the mid-palate. There’s just a gorgeous sweet plum aroma on the nose that is so cool-climate Syrah. The tannins are there but they exist in the background and this makes the wine, like most Saint Josephs, very versatile with food. This Syrah would pretty much go with anything you’d serve a Pinot with. It’s light and easy to drink but it’s not an insubstantial wine, it has a lot of complexity and interest, again very similar to Pinot. This wine is made with indigenous yeast fermentation and aged in various sizes of neutral oak barrels. The grapes are de-stemmed. 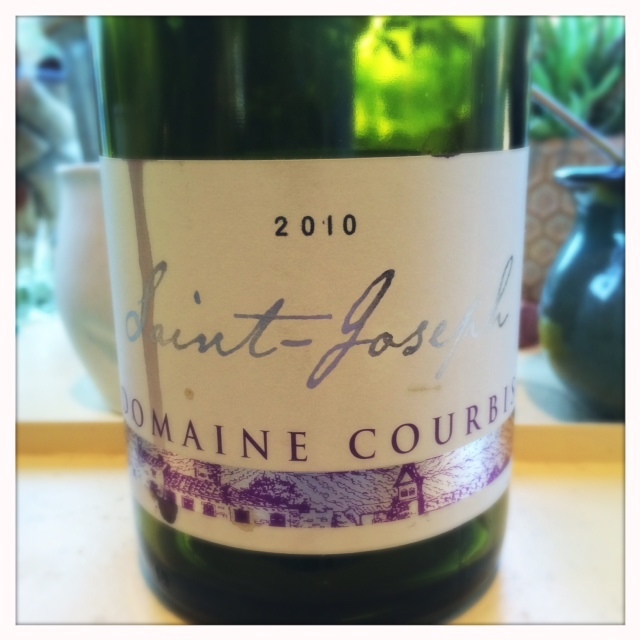 If you like Syrah, you need to check out wines from St. Joseph. They are often in the lower price range (both these wines retail for under $30) in comparison with the other star appellations in the Northern Rhone but they are beautiful, elegant expressions of Syrah. Meanwhile, I’ll go back to pining for a trip to Syrah’s ancestral home. I’ve been meaning to stop by Steve Law’s new tasting room in Sonoma for quite a while so, on a recent trip to Sonoma to visit my mom, I made it a priority. I love to talk Syrah with Steve, he has first hand knowledge of the Northern Rhone having lived there for years for his work. He’s also committed to making Syrah in a restrained style that’s food friendly. Steve’s at home and happy in his new tasting room right off the Sonoma Plaza. Steve generally has a few lower alcohol styles of Syrah that are right in my wheelhouse but he also has a couple of bigger Syrahs from warmer sites. Even those are made in a restrained style. If you’ve been following this blog, you know that I’ve made some recent forays into slightly bigger styles of Syrah. Although these have been delicious wines, with their full mid-palates and rich fruit, I must admit that I’ve been excited to write about a wine that is truly cool-climate. Well, I found one in the Atoosa’s. I was a bit worried when I found out that Steve was no longer making one of the best California Syrahs that I’ve tasted, the Judge Family Syrah, but the Atoosa’s really fills the void. It has that same savory Northern Rhone character that the Judge has. I’d say this one tends a little less towards St. Joseph and a little more towards Cornas because it’s a more reserved and slightly more tannic version of Syrah (although it’s not really that tannic). As many of you know, cool-climate Syrah isn’t the type of wine to reveal all its charms upon first opening. It’s reserved and needs some time to open. With some time in the glass it revealed beautiful aromas of sweet plum, pomegranate, black olive and tobacco. On the mid-palate the best way I can describe this wine is that it’s crunchy. 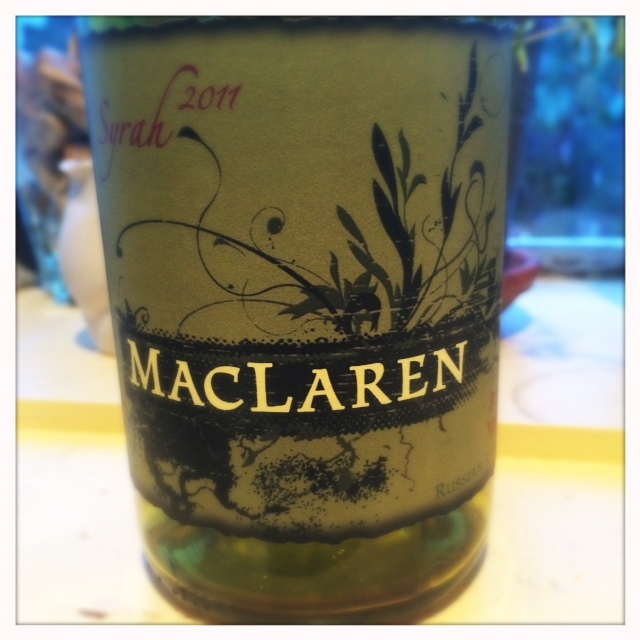 There’s this sense of a crunchy pomegranate or a crunchy apple with a nice lift of acidity on the finish. There are some tannins on the finish too but they’re integrated and not harsh. I LOVE this wine and I’m so glad that Steve found a good replacement for the Judge. If you love Syrah and you haven’t had any of Steve’s you owe it to yourself to search them out. The 2011 Samantha’s Vineyard (ABV 13.5%) is a Russian River hillside site. It’s a nice Syrah with a fuller mid-palate but still good acidity. I got some cigar box aromas on the nose along with a bit of eucalyptus. Nice lift on the finish. The 2011 Drouthy Neighbors (ABV 13.5%) is Steve’s Syrah blend from his different vineyard sites, 50% Samantha’s, 33% Atoosa, and 17% Stagecoach. It has a good core of acidity and lots of blackberry aromas. Again, the low tannins and high acidity make it super food friendly. The 2011 Stagecoach (ABV 14.2%) is Steve’s biggest Syrah. It sees some new oak (20%) and therefore has some vanilla aromas on the nose. There’s a gorgeous mouth feel to this wine but it’s definitely a more blue fruited style, a Syrah that kind of fits that stereotypical Syrah and barbecue ribs pairing. Except for the Stagecoach, all of these Syrahs see only neutral oak and are made with a technique that Steve learned from his time in the Northern Rhone that uses a lower pressure on the bladder press to minimize tannic extraction and make a more elegant style of Syrah. Whatever your preference, Steve has a Syrah for you. On first opening, the Apsara didn’t have that characteristic cool-climate savory character that I usually get from Las Madres Syrahs. Let’s remember how young this wine is though. Initially, I got more of a fresh fruit character with soft tannins on the finish. On the second day, the wine had more of those savory elements that I’m used to from Las Madres, more of a black olive aroma and beautiful sweet plum. Not much oak on the nose. It’s an elegant, low-tannin Syrah that’s smooth and easy-drinking with a real rich mid-palate and a bit of heat on the finish. I think it will develop well over the next year and I expect more savory elements to surface. 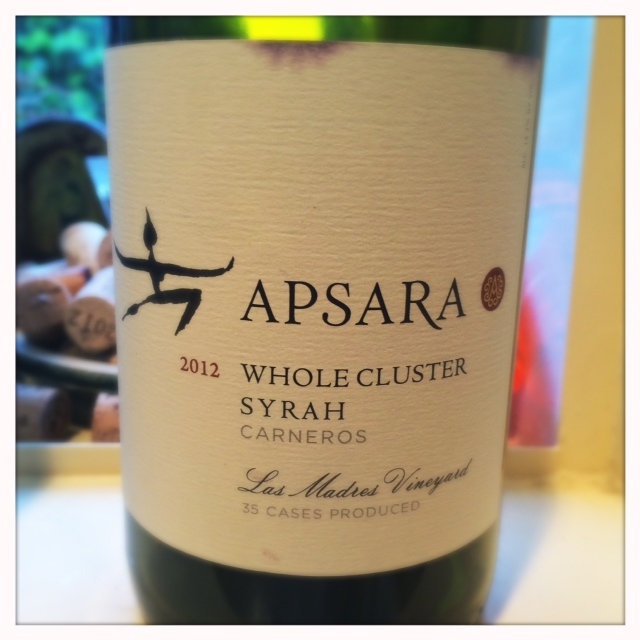 The Apsara whole cluster is similar to the regular Syrah with the rich mid-palate but there’s an added complexity of whole cluster. The olive character is still there but it’s more green than black. There’s plum too and a hint of smoky tobacco. The mid-palate is rich and full and again, just the slightest heat on the back end. These are delicious wines and representative of the rich but complex wines from Las Madres Vineyard. I’m very interested to see how they develop. Apsara’s winemaker Robin Akhurst crafts the wines in Calistoga at the Envy Wines facilities where he runs their custom crush program and also makes about 3,000 cases of wine for Envy. Apsara is his personal project, started with his wife, and the wines, therefore, match his own palate preferences. Robin was born in the States but raised in Scotland where he developed an appreciation of wine that led to an enology degree from Edinburgh University. He headed out to the wine world to learn as much as he could from other winemakers and then he and his wife decided to settle in Northern California. 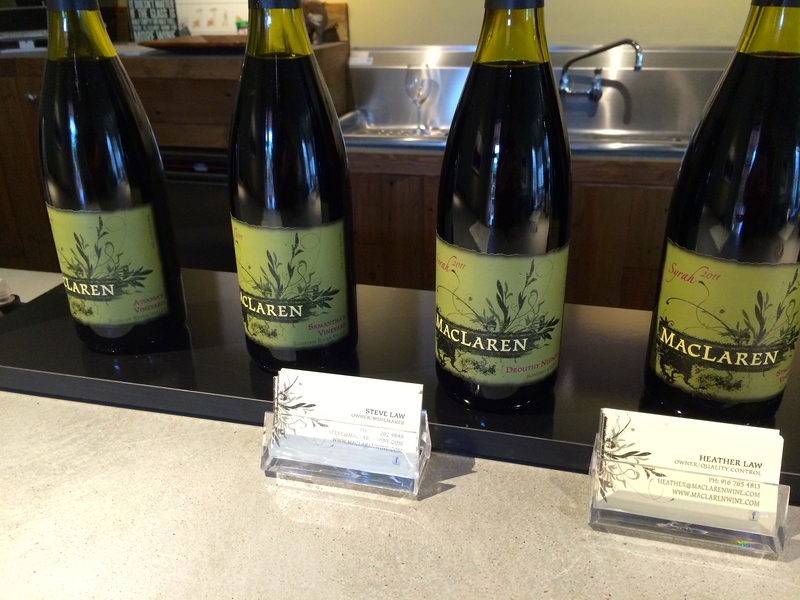 The Las Madres Syrah was Robin’s first vineyard source and he also has a 2013 Napa Sauvignon Blanc and a high-altitude Cabernet in the works. 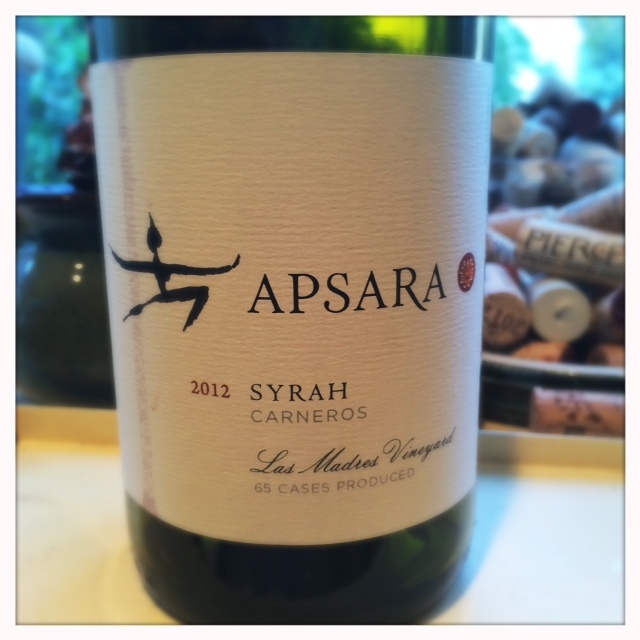 It’s the Syrah I’m most interested in, of course, and it’s a great example of Syrah from Las Madres. I think it’s going to progress even further in bottle. Both these Syrahs hover around 14% alcohol and retail for just under $40. At Bedrock Vineyard: It’s raining and the vines are happy. 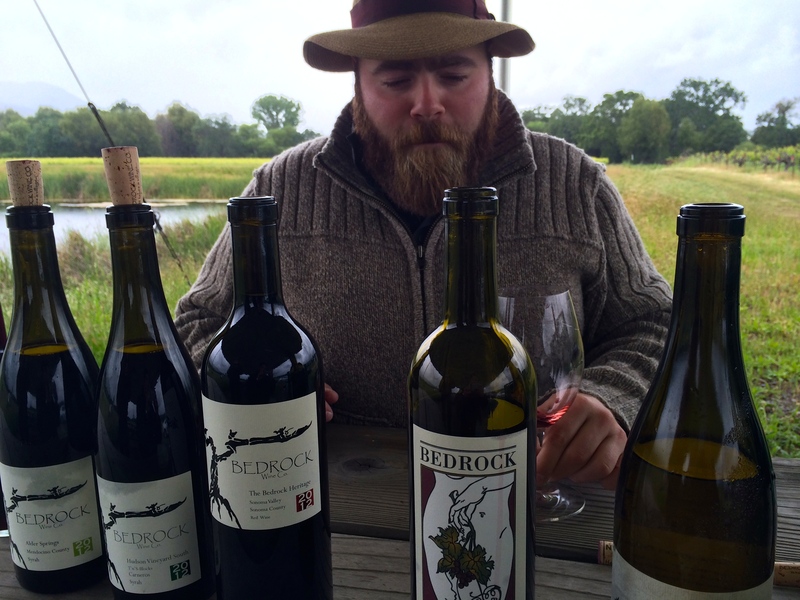 The recent rain storm in the Bay Area didn’t keep Chris Cottrell from hosting a tasting session out in the middle of Bedrock Vineyard the other day in Sonoma. It was wet, wetter than either of us expected, as we hunkered down under an event tent which didn’t really help against the driving sideways rain. Undaunted, we tasted through some of the recently bottled 2012 wines. I shivered through a gorgeous, yet cold, Sauvignon Blanc that Chris seemed more prepared for with his warm hat and beard. My shivers finally stopped as we worked our way through the reds. Chris is not bothered by the rain. 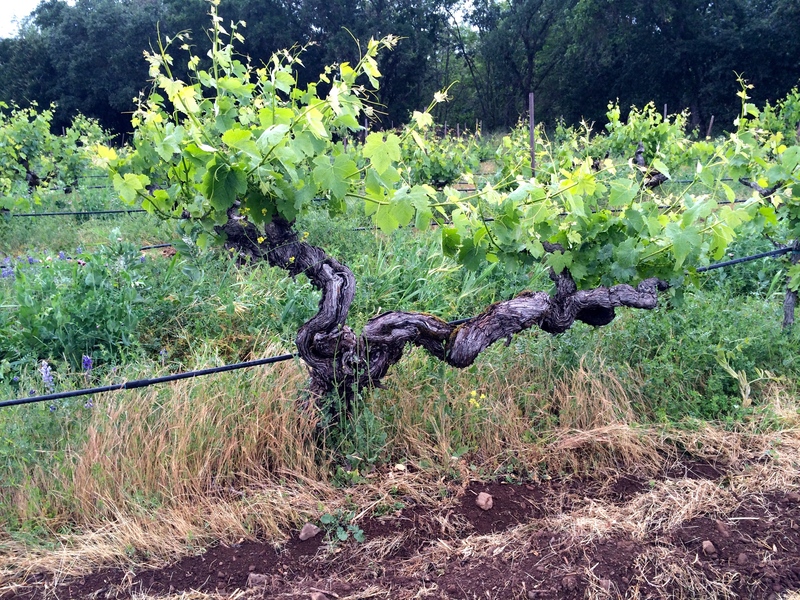 One of the oldest Syrah vines in California in Bedrock’s mixed varietal home vineyard. Bedrock Wine Company has not given in to the recent trend towards low alcohol wines, in the tradition of Morgan’s father’s “No Wimpy Wines” campaign of the 1980s these are bold and brash reds. Morgan doesn’t pick just to keep the wines under a certain alcohol level and he believes in embracing California’s sunny climate. The 2012 vintage was a sunny one that offered ample opportunity to reach optimum ripeness. In fact I wondered if I was perhaps jumping the shark for my blog on restrained cool-climate Syrah when I looked at alcohol levels that rested in the upper 14s. But the truth is, while they are bold, these are also balanced wines in their own way. No, they’re not restrained but there’s good acidity and freshness there. This wine is big fruit epitomized. I got less of the meaty, bacon side of this particular Hudson Vineyard but it’s possible that these will develop as the wine develops in the bottle. This wine has a full and rich mid-palate that’s characteristic of the vineyard. It’s a blueberry, fruity Syrah at the moment but it’s still fresh on the palate. There are tannins present on the finish. Interestingly, Hudson used to be the coolest-climate Syrah vineyard in California but now it’s the warmest site that Bedrock works. That’s probably the result of a combination of two things: 1.) that global warming has been responsible for a general warming of the area and 2.) 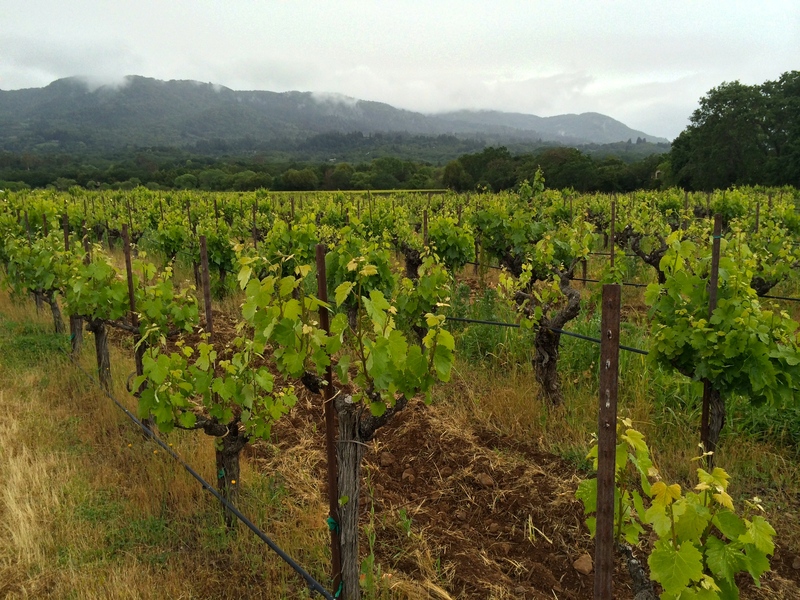 our idea of where Syrah is grown has also changed through the years and we now see it grown next to pinot in the far reaches of the Sonoma Coast. I tasted this wine in barrel last year and boy was it a tannic bomb. I guessed that it would have calmed down a bit but it’s still a big boy with a mouth-puckering finish. It’s got some beautiful fresh fruit though. There’s some alcohol coming through but in general the wine’s individual parts work well together. I’ll be very interested to see how these wines develop over time. Alder Springs is really a benchmark vineyard for Syrah in California and I’ve had both cool-climate and warmer climate styles from here. This one is in between, it’s big and fruity but retains a fresh and structured mid-palate. Anything but jammy. In general, even though these wines are pushing what I thought was my alcohol level limit for Syrah, I think they are representative of a warm 2012 vintage. And they’re far from wimpy. Chris said that the 2013 vintage is a tad more restrained. I love checking in with Bedrock’s treatment of Syrah, they are bigger styles than I normally appreciate but there’s that freshness and structure to the mid palate. One last thought: It’s possible that the high percentage of whole cluster in the wine might be the reason for the high acidity in the wines which help retain some of that mid-palate structure. The issue of whole cluster is one that I want to delve into more.